The Prophet Muhammad (saws) said: Musa, the son of Imran once asked, "Oh my Lord! Who is the most honorable of Your servants? And He replied, the person who forgives even when he is in a position of power" (Baihaqi). Peace and blessings be upon the Prophet. You know what I'm referring to - those times when you get into an argument(s) with a family member, friend, boss, employee, coworker, classmate, teacher or whoever. You know your facts are right or that you've been wronged with an insulting remark, sarcastic comment or rudeness. And so, you choose to hold a grudge. After all, you've got a right to. Nobody should be treated this way. Why should you forgive? You're not the one who started this. You're not the one who doesn't have the facts straight. True. You may be right. You may be in that position of power mentioned in the Hadith above. But forgiving others, apart from positively affecting our health (less stress) and our minds (one less negative thing to focus on), is a necessary step to closeness to God. How can we move up the ladder of spiritual development when we hold bitterness and anger towards another person? While we may have been in the right, is it worth sacrificing our energy on a grudge instead of on growth? Is there not something strange about asking for God's forgiveness of our sins while withholding our forgiveness from someone who has hurt us? 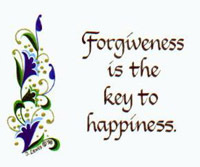 One of the distinguishing features of Ramadan is forgiveness. The Prophet explained in one Hadith that Ramadan is a month whose beginning is Mercy, whose middle is Forgiveness and whose end is freedom from the Hellfire. This makes it a great time to ask God for His Forgiveness. It's also a wonderful time to open our hearts and cleanse them of grudges and bitterness by forgiving others. The path to connection to God is always paved with tests and difficulties. Nobody gains spiritual upliftment without having to prove their mettle. This process includes facing all kinds of hardships, including injustice at the hands of others. If we truly want Allah's love, mercy and forgiveness, we must remember that the hurts of this world are temporary, and we are working towards that which is permanent. Is it worth being bitter and stunting our growth? Will it really benefit us? How will our anger and bitterness change the person who has hurt us? Let us use these remaining days of forgiveness this Ramadan to open our hearts to those who have wronged us and forgive them as we beg Allah to forgive us.